At the end of July, Sean and I went to Santa Cruz to participate in the Santa Cruz Museum of Art & History‘s MuseumCamp 2014. The camp took place over three and a half days, attracting over one hundred campers from around the world to create, implement, and analyze evaluations of social impact. Indicators ranged from social bonding at a Jerry Garcia concert, to the relationship between technology and experiences in nature, to social bridging at MAH. Sean and I served as counselors, helping several teams navigate through the process. For a list of participants blog posts, click here. Action research makes the experience fun and fulfilling for respondents/participant and research alike. One of the methods we promote is participatory in-depth interviewing. It is participatory because we ask the client to participate in the actual interviewing of their own audiences, donors, and/or community members, and thereby increasing their learning. Hearing from the horse’s mouth increases the likelihood that constituent feedback will have a lasting impact on the organization. Surveys are a form of conversation. As Nina says, stay away from the word “survey”. We do a lot of surveying here at WolfBrown. It is useful, and often quite necessary, and everyone understands what a survey is, for the most part. However, many people steer clear of participating in surveys on principle, and some clients prefer to avoid surveys as a method altogether. I’d advise all of us to start thinking of “surveying” more as a conversation. You ask questions; people respond. Hopefully, through social media tools and our new respondent interface for the dashboard, organizations will continue this conversation by sharing how participants responded to questions (e.g., “This is how you and others said the program made you feel:” — and then displaying a word cloud of reported emotions). Getting away is important. MuseumCamp forced all of us to set aside three whole days of time to one task — developing, implementing, and analyzing an evaluation of social impact. As others alluded to, the length of time (two days of workshops, rather than just one) helped increase individual learning, whether or not the research was effective or successful. Many came from out of town and had no other options, really, but to concentrate on this experience. 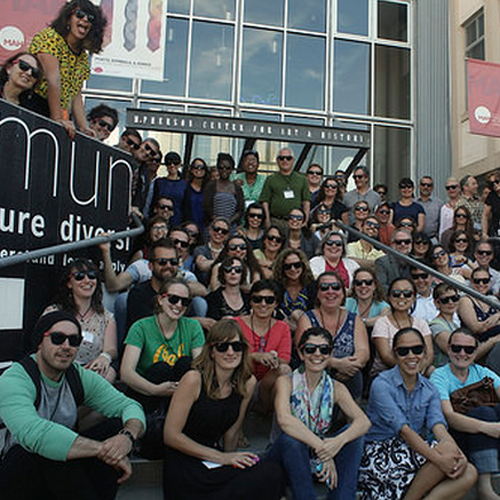 By committing to MuseumCamp, we gave ourselves permission to do nothing else but absorb, learn, and experiment. When do you get to do that in your day-to-day work life? Shifting between doing and absorbing/experimenting is difficult, but rewarding. I often find myself behind in my blog readings because other activities take priority. But when I have a chance to get away, or take the time to dedicate one-half or a whole day to reading and reflection, I have a greater chance of retaining the information — and subsequently being able to translate and use that information for future work. I am currently working on developing shared learning experiences for a group of arts organizations in the Bay Area, and with my collaborator, Sheena Johnson, Program Fellow at Hewlett Foundation, have planned to facilitate half- to full-day off-site “retreat” experiences for each Learning Circle or Group that we establish.